President Donald Trump kicked off a recent debate when he claimed he can use an executive order to end citizenship that is automatically granted to U.S.-born children of undocumented immigrants. “They’re saying I can do it just with an executive order,” he said, in an interview with the news site Axios. His position met strong opposition, including from influential members of his own Republican party. 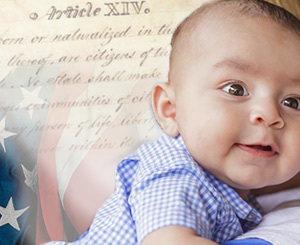 “You cannot end birthright citizenship with an executive order,” House Speaker Paul Ryan said flatly. Who’s right? The issue of who is a U.S. citizen has been a recurring question in American constitutional law since the time of slavery. A defining event came immediately prior to the beginning of the Civil War when U.S. Supreme Court Chief Justice Roger Taney wrote the 7-2 opinion in the Dred Scott case stating that African-Americans were not United States citizens. It would take a lengthy process for a constitutional amendment – rather than a congressional statute – to change the constitution. But the president’s statements have raised questions about the sanctity of the 14th Amendment as written and whether a president has the authority to interpret the amendment to his liking through an executive order. Executive orders have been successfully challenged in court. The most notable rebuke to a president came after Harry Truman signed Executive Order 10340 in 1952, which placed all U.S. steel mills under federal control during the Korean War. The U.S. Supreme Court ruled 6-3 in Youngstown Sheet & Tube Co. v. Sawyer that Truman had overstepped his authority because he attempted to make law rather than clarify an existing piece of legislation. The president and a few legal scholars say the U.S. Supreme Court has never directly addressed whether the children of undocumented immigrants fall under the 14th Amendment’s “subject to the jurisdiction thereof” clause. Signing an executive order would be a way for the president to try to press the high court for clarification. But a string of U.S. Supreme Court cases since a landmark decision 120 years ago would appear to work against the president’s argument. In Plyler v. Doe in 1982, the Supreme Court, by a 5-4 vote, provided undocumented children the right to a public education. A Texas school district had argued that persons who have entered the U.S. illegally are not “within the jurisdiction” of a state even if they are present within its boundaries and subject to its laws. The majority in Plyler rejected that argument. “Nor do the logic and history of the 14th Amendment support such a construction. Instead, use of the phrase ‘within its jurisdiction’ confirms the understanding that the Fourteenth Amendment’s protection extends to anyone, citizen or stranger, who is subject to the laws of a State, and reaches into every corner of a State’s territory,” the court said. So who is right: the president or the speaker? Unless the U.S. Supreme Court has a change of mind, it would appear the speaker has a stronger legal case.